I like dice. I mean, I REALLY like dice. I have more dice then I could ever use in a lifetime and I'm still buying more. Dice with gimmicks are fun too. 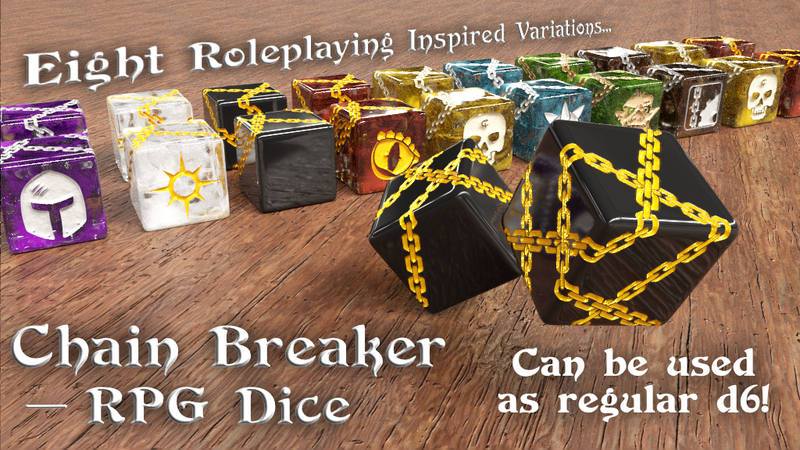 Chain Breaker RPG Dice? Definitely a gimmick. Personally, not sure how well it works. Sure, the above looks kinda cool but has no place in a game. So, how do you read them? To use the dice, the value for each side is how many parts that side is split into by the chain. 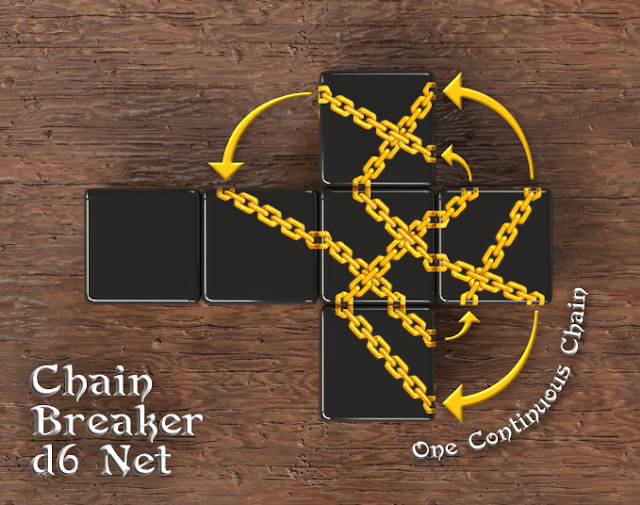 In other words, count the empty spaces created by the chain – not the chain itself. The patterns of the chain on each side have been carefully chosen to make each an easily recognisable symbol so there is no need to count each time – just like the sides of normal dice. The blank side, with no chain through it, is worth one. Each of the eight different Chain Breaker colors feature their own unique artwork on the otherwise blank 'one' side. Counting pips? Sure. Counting empty spaces that differ in size? Not so sure. Six days left in its funding period. 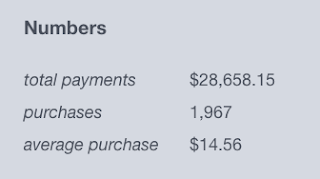 About 58% of the way to 20k. What a surprising guilty pleasure. I almost didn't make it through the 1st episode of Van Helsing - needlessly over the top gore. But here I am, 2 days and 12 episodes later and I'm really digging the series. I like how we get some insight into both sides of the conflict. Not just our very flawed heroes but their adversaries, the vampires. Living among humans for centuries, a volcano plunging the west coast of the United States into a state of ash darkened skies has brought vampires to a position of strength. The politics behind the power players is an interesting subplot. Tavern Steins awarded - 4 out of 5. 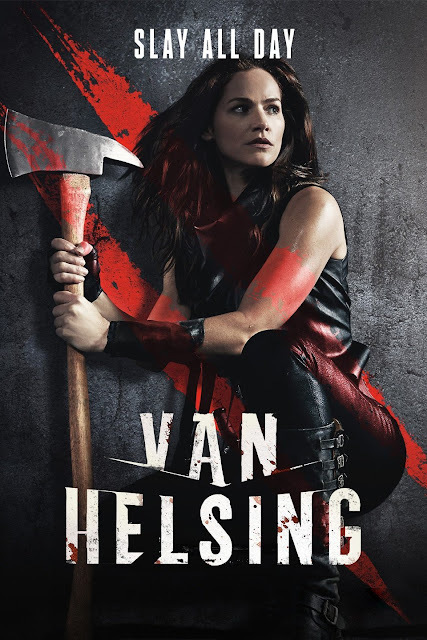 Better than the first season of Shannara Chronicles IMHO. I'll have to give my thoughts on that later. Join in on the voice chat or just lurk - we don't bite - and if we did, everyone should have their shots already. 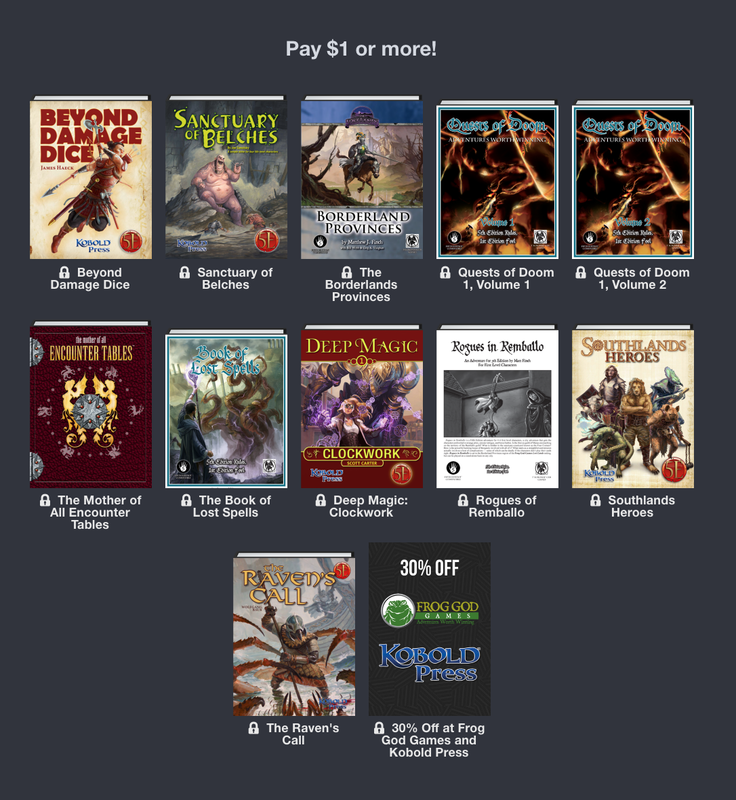 HUGE 5e Humble Bundle from Frog God Games / Kobold Press! When a single buck can get you so much, does game system even matter? I find myself asking this question today, as the Frog God / Kobold Press 5e Humble Bundle offers so much for 5e for so little, its a no brainer to convert some of this to Old School Gaming. Heck, a buck for a 30% off coupon ain't bad either. Besides, sourcebooks are effectively systemless anyway. Its the words that matter, not the numbers. 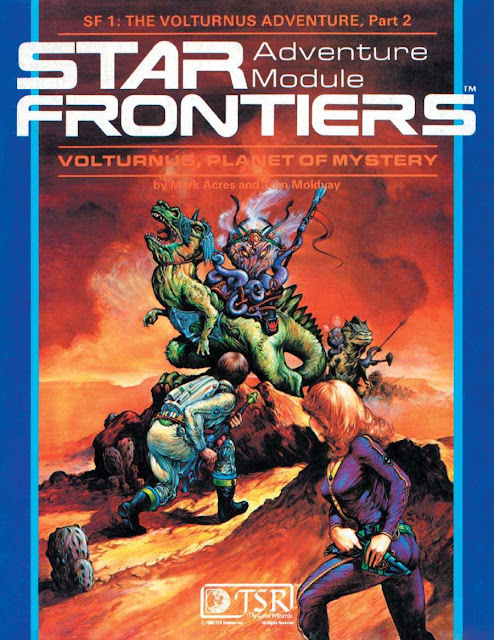 And adventure ideas are easy enough to convert on the fly. 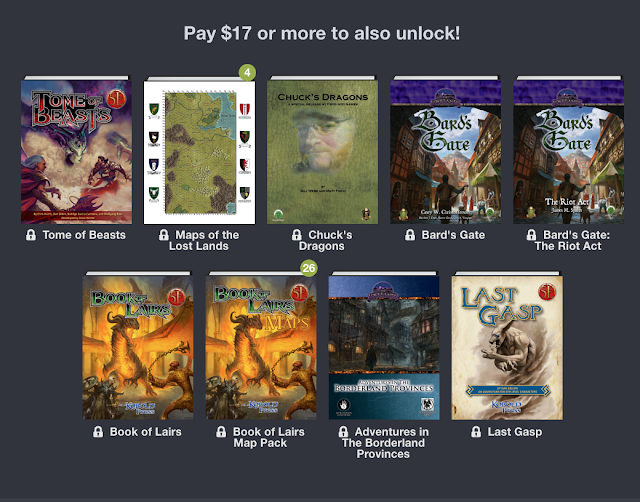 Do I see maps of the Lost Lands in there at 17 bucks? Why yes I do! 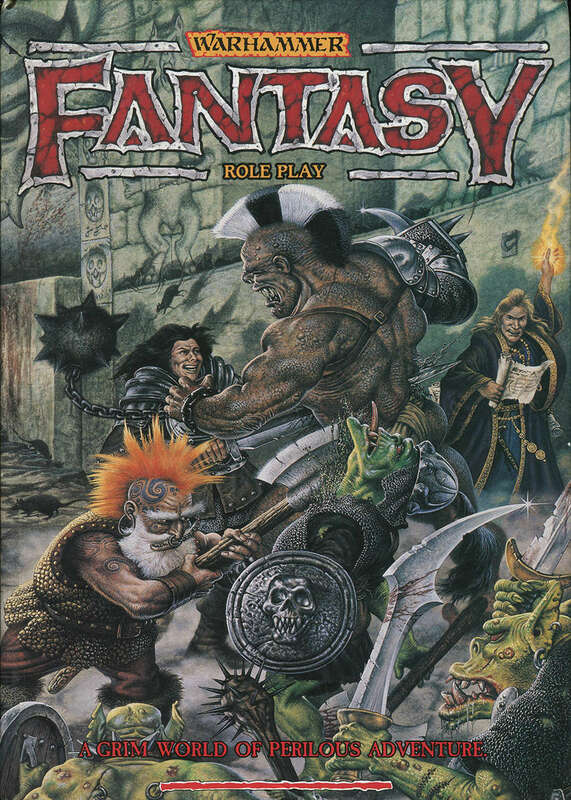 As promised, the Warhammer Fantasy Roleplay First Edition Core Rulebook has released in PDF on RPGNow. 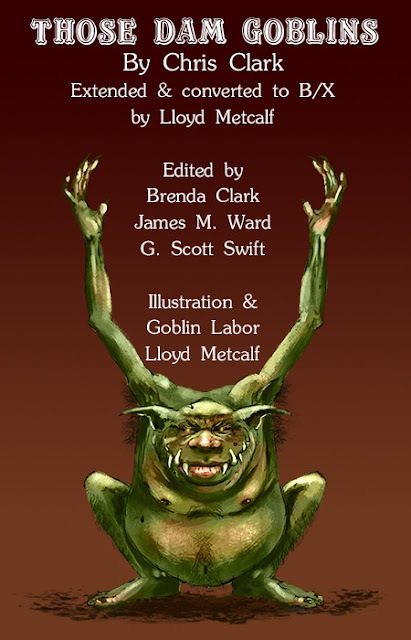 Priced at $9.99 it makes claims to be an accurate representation of the printed original. Bookmarks alone make this awesome. Fully OCR'd, bookmarked and cleaned up to look amazing, the first edition of the seminal Warhammer Fantasy Roleplay comes to PDF! Observant readers will recognize the affiliate link above (if you aren't that observant, we've now told you) - Affiliate links keep the lights on here at The Tavern and we thank you. There are some affiliate links above. Affiliate links keep the taps flowing and the lights lit here at The Tavern. I thank you. Troll Lord Games "Advent Calendar Sale" with Bonus Flash Sale to 8 PM Eastern Tonight! Castles and Crusades is really cheap today if anyone is interested. 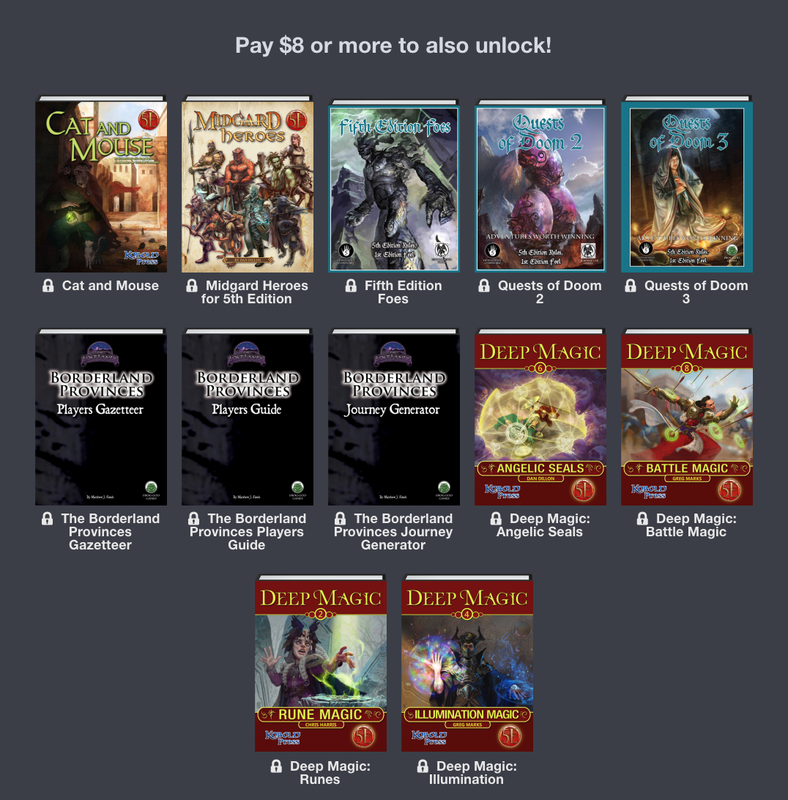 Looks like you can get a Player's Handbook, Monsters & Treasures, Castle Keeper's Guide, CK Screen, Lion in the Ropes Adventure Modules, Character Reference Sheets and Arms & Armor for about $58 plus shipping. 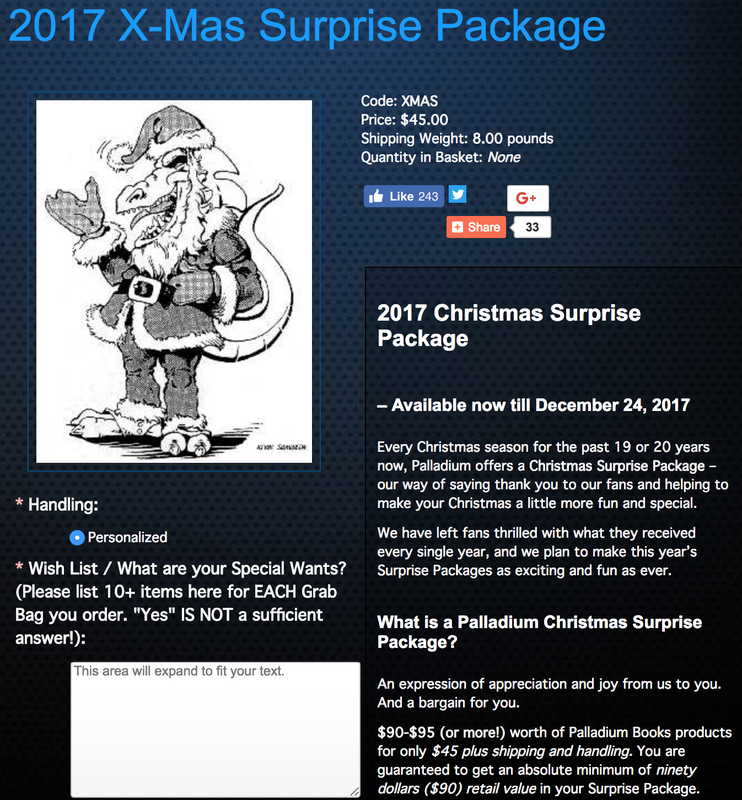 Valid until 8pm EST, code FLASH50NOW and it's applicable on the bundles. 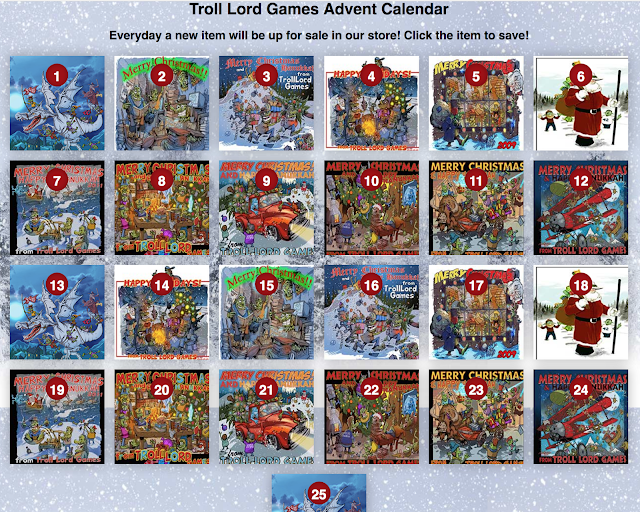 The Troll Lord Games Advent Calendar Sale reveals a new sale every day for the month of December until Christmas. Prior day's sales do NOT appear to expire. ENWorld has about 32% of its readership in the 16 to 24 age group. 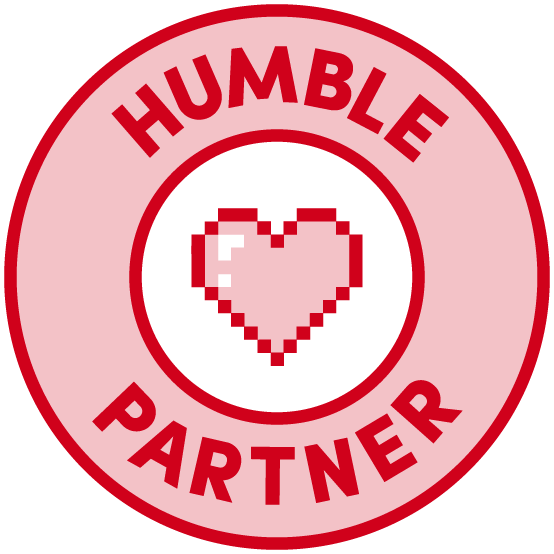 RPGNet has about 37% of its readership in the 16 to 24 age group. 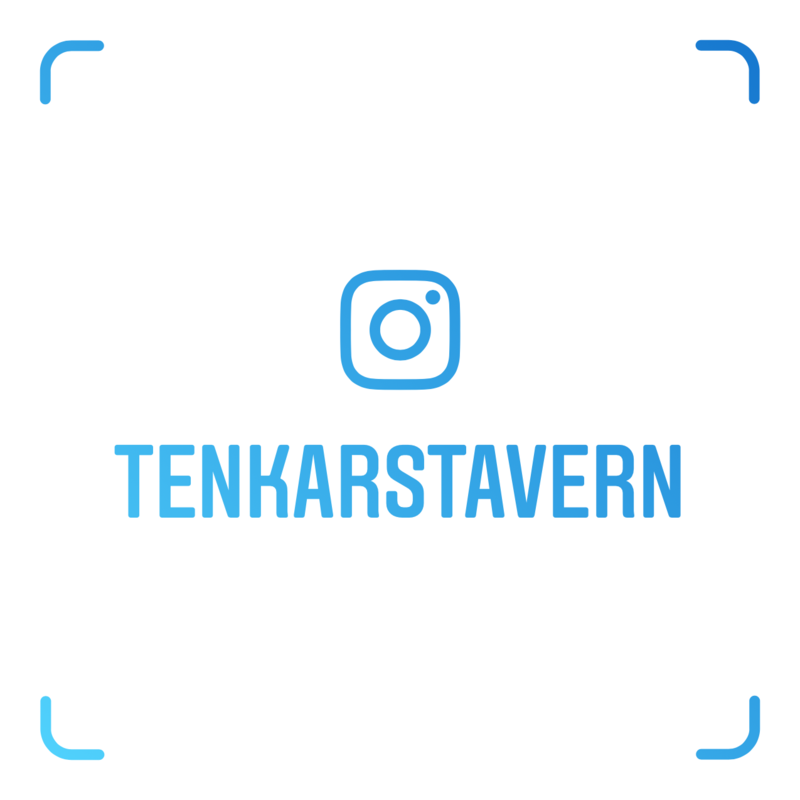 The Tavern's Facebook Community comes in at 2.4% of its membership in the 16 to 24 age group. 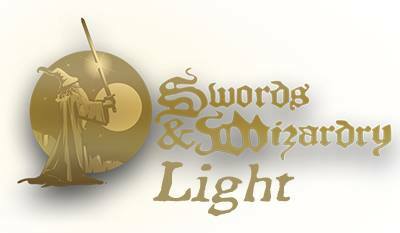 The Swords & Wizardry Facebook Community comes in at 4.9% of its membership in the 16 to 24 age group. Those younger gamers will be older gamers at some point. Current older gamers will age out and pass on at some point. 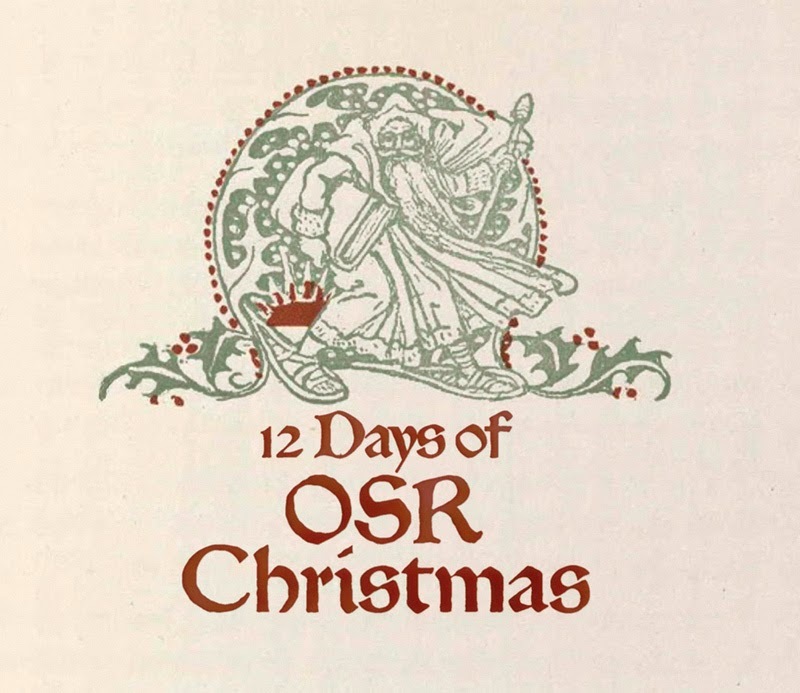 Maybe the OSR needs to find a way to tap into the younger player demographic. 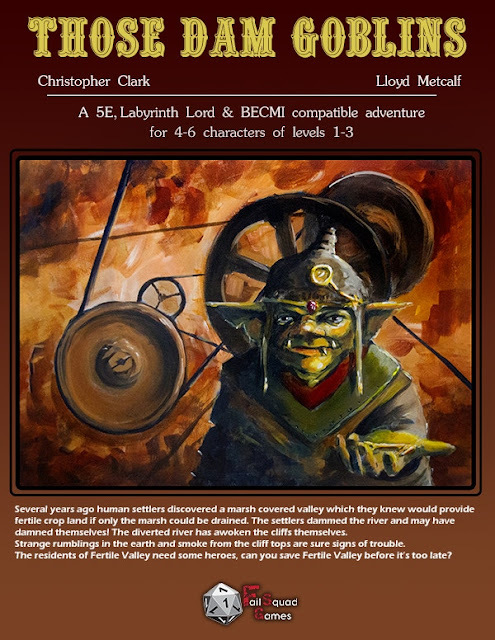 If you've been following my Kickstarter posts, you would know that +Lloyd Metcalf / Fail Squad Games is always on time if not early AND backing Lloyd's KSs doesn't break the bank. 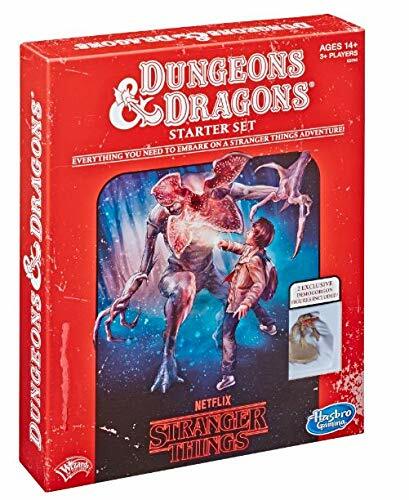 They are old school friendly while still being a perfect fit for 5e. In other words, they are Win / Win and I expect more of the same from Those Dam Goblins. Written by Chris Clark with additional work and art by Lloyd himself, Those Dam Goblin's is the latest release from Fail Squad Games.